About one million Chinese-made, Simplicity brand cribs are being recalled in the USA after three infants died and seven were trapped when the drop side of cribs detached causing a dangerous gap, according to the Consumer Product Safety Commission. Failures in the crib's drop side are due to a combination of hardware and design flaws that allow consumers to unintentionally install the drop side upside down. This installation could weaken the hardware and cause the drop side to detach from the crib, creating a gap that could lead to the entrapment and suffocation of infants. Risk of entrapment or suffocation is greater in cribs with drop sides installed upside down, however problems were also reported involving those that were correctly installed. The recall affects cribs using older hardware. Consumers using cribs with new hardware are urged to check that drop sides are installed correctly and are not broken. One 9-month-old child and one 6-month-old child died in cribs using older-style hardware that had the drop-side installed upside down. The commission is also investigating the death of a 1-year-old child in a Simplicity crib with newer-style hardware in which the drop-side was installed upside down. The safety commission is also aware of seven infant entrapments and 55 incidents involving the cribs. Two incidents were also reported involving cribs with drop-sides that were correctly installed, though the upside-down installation greatly increases the risk of failure, the commission says. The affected cribs include the following models: Aspen 3 in 1, Aspen 4 in 1, Nursery-in-a-Box, Crib N Changer Combo, Chelsea and Pooh 4 in 1. The recall also involves Simplicity cribs Aspen 3 in 1, Ultra 3 in 1, Ultra 4 in 1, Ultra 5 in 1, Whitney and the Trio using the Graco logo. The recalled cribs have the model numbers 4600, 4605, 4705, 5000, 8000, 8324, 8800, 8740, 8910, 8994, 8050, 8750, 8760, and 8996, which can be found on the envelope attached to the mattress support and on the label attached to the headboard. 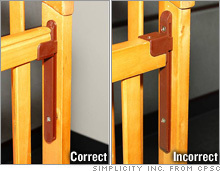 Consumers with recalled cribs, which use older hardware, can contact Simplicity immediately for a free repair. 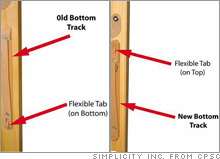 As an immediate precaution, the Consumer Product Safety Commission urges that consumers with cribs using old or new hardware make sure that the drop-side is installed right side up and is securely attached to the tracks in all four corners.